Just finished reading through all posts on the forum (362 I think) back to pre 2002. Amazing amount of information and contacts. Was sad that photos on early posts have gone away. My 36 D2 4 dr in the shop for brakes, a fuel problem, and a few other small issues, hopefully ready for Spring. Cannot tell you how valuable the forum was for troubleshooting problems. 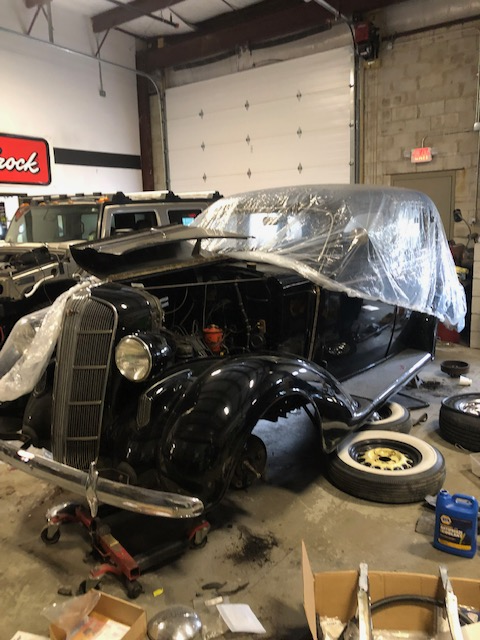 The shop is South Shore Customs Plymouth MA with parts help from Then and Now Auto Weymouth MA. I have two questions forum members can help me out with. Obviously I am on the forum but am I a member of the AACA oor DB club? Are there other Dodge associations on the forum that you can join? Again thanks to all who started and keep this forum up, Please tell me what I am not a member of that pertains to early Dodge cars. This is the Dodge and Dodge Brothers section of AACA forum. Unless you pay dues you are not actually a member of either club, just a member of the AACA forum. The Dodge Brothers Club has it's own website and forum. Anyone can read on the DBC forum but must register to post. Of course the DBC is for 1914 to 1939 DBs and Graham Brothers trucks but you don't have to own a car to join. Of course the DBC is for 1914 to 1939 DBs and Graham Brothers trucks but you don't have to own a car to join. 1938. After that it was just Dodge.